Tommy Wright hailed match-winner Steven MacLean after his goal edged St Johnstone to a 1-0 win over Aberdeen. The game looked set on course for a goalless draw with chances at a premium before MacLean found the net from Michael O'Halloran's cross. 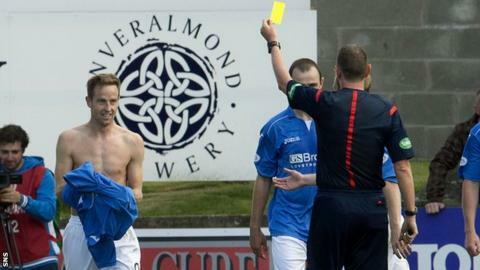 "He's a big character in the dressing room," Wright told BBC Radio Scotland. "On and off the pitch he's a leader for us, he's someone that gets people going. He's a good footballer, he's a good number nine." Saints had the better of the opening 30 minutes with MacLean, David Wotherspoon and Gary MacDonald all going close. The game lacked the same fluency in the second half, but Wright felt his side fully deserved the three points. "He [MacLean] knows how to link it up, and probably doesn't get enough goals because of the unselfish work he does outside the box," he said. "But he's someone I'm glad I've got. "The games [against Aberdeen] have all been tight over the last couple of seasons. We thought we probably had the better opportunities in the first half even though they hit the bar. "I've still got confidence in what we've got. We're doing things the right way, we were creating opportunities. "At 0-0 I thought the first goal was always going to win it so I think it was important that we got it. "Over the 90 minutes that was more like us. We started well and were competitive from the first whistle and that helped our overall performance." Wright says he is still searching for a replacement for last season's top goalscorer Stevie May, but does not expect a signing imminently. He said: "We'll wait and see. We've one coming in on trial this week, but we're no further forward."